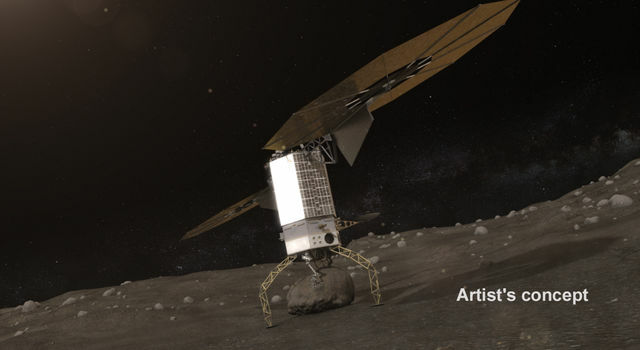 The Asteroid Redirect Mission was intended to develop a robotic spacecraft to visit a large near-Earth asteroid and collect a multi-ton boulder from its surface. It would then redirect the boulder into orbit around the moon, where astronauts would have explored it and returned to Earth with samples. White House Space Policy Directive 1, issued Dec. 11, 2017, ended the mission. but many of the central technologies in development for that mission, such as solar electric propulsion, will continue, as they constitute vital capabilities needed for future human deep space missions. NASA's Jet Propulsion Laboratory in Pasadena, Calif., has selected four companies to conduct design studies for a solar-electric-propulsion-based spacecraft for the agency's Asteroid Redirect Robotic Mission (ARRM). NASA, through JPL, has issued a call to American industry for innovative ideas involving the Asteroid Redirect Robotic Mission.